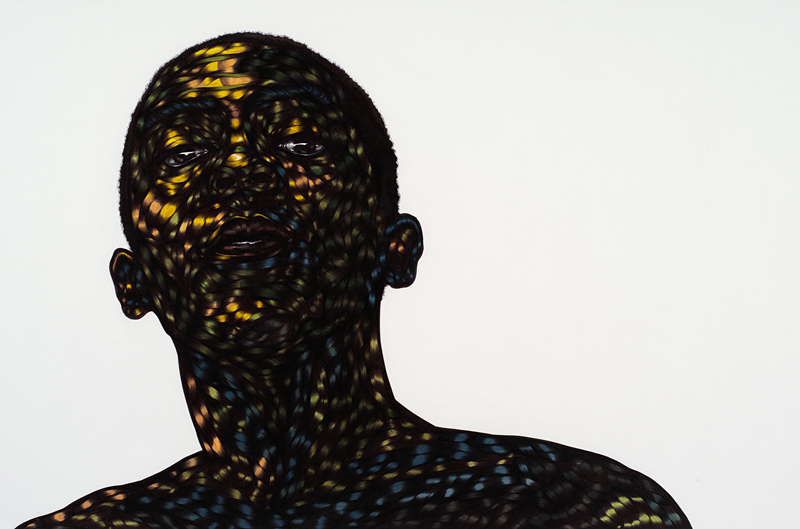 Toyin Odutola was born in Ife, Nigeria and was largely raised in Alabama. 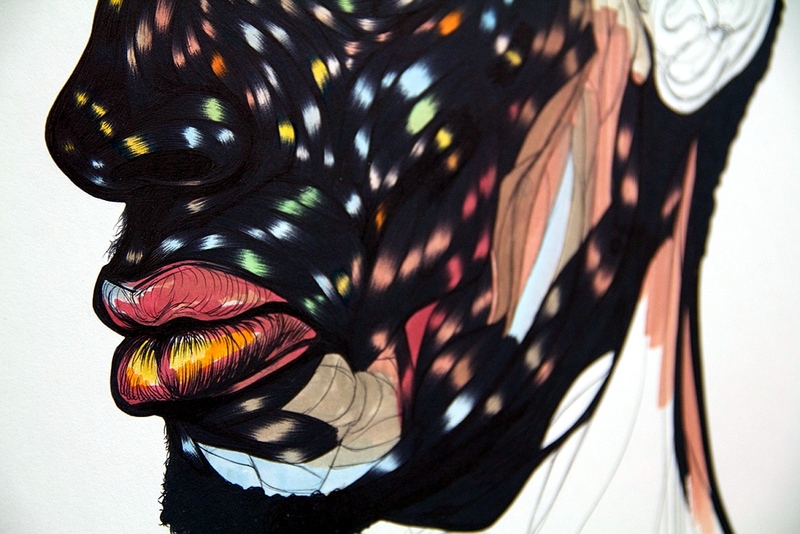 She received her MFA at the California College of the Arts in Painting and Drawing. 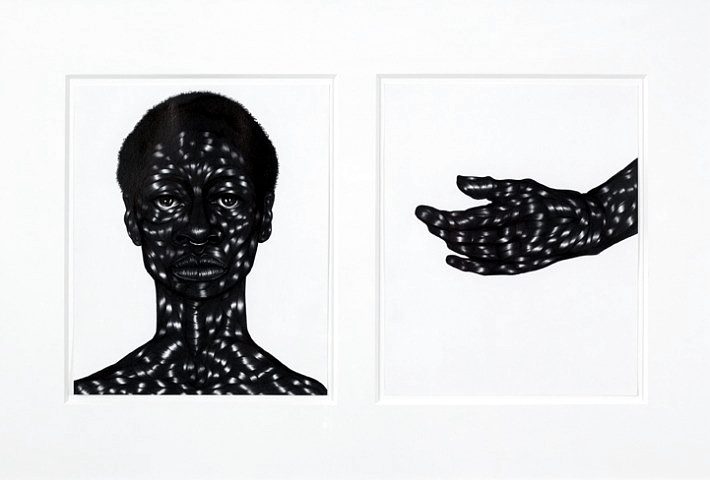 Her work often centers around the possibility that an individual’s subjectivity, various realities and experiences can literally be drawn onto the diverse terrain of one’s skin. 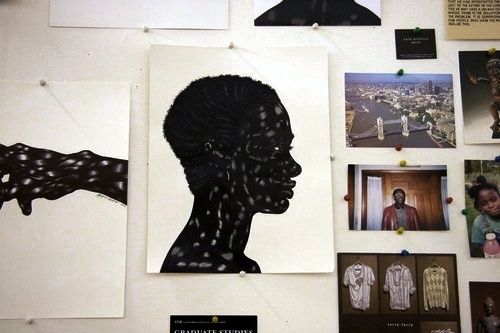 Odutola’s first solo exhibition, “(MAPS),” debuted in 2011 at the Jack Shainman Gallery, New York. 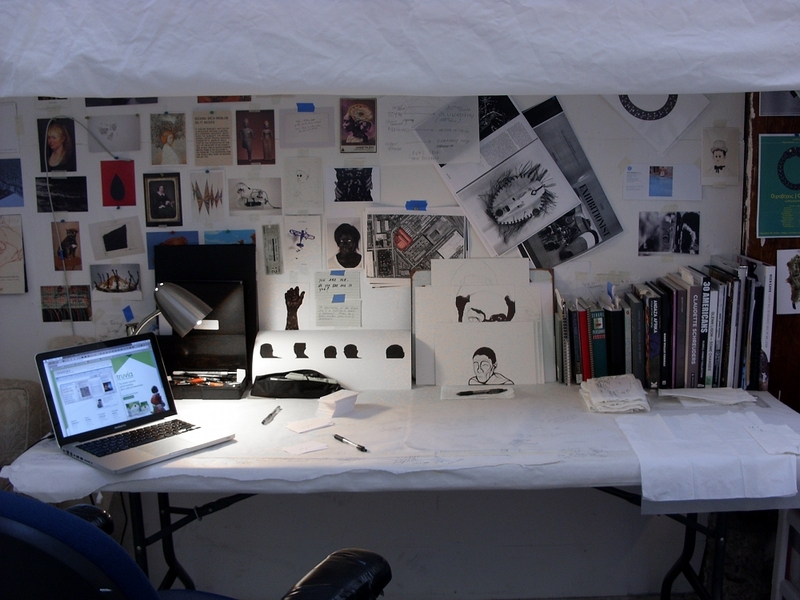 TOYIN ODUTOLA: On my desk or sitting on my small couch with a lapdesk, drawing. I have my selection of pens lined up and close, ready for grabbing, and my papers close by in case the drawing at hand goes awry. I like to work with my laptop close: playing music, listening to an audiobook or podcast, or watching some random film. It’s a pretty basic set up that I like to keep neat and tidy, to minimize any visible distractions. People latch onto eyes for familiarity, but they can also be that moment in the portrait that is the most “foreign” to them. 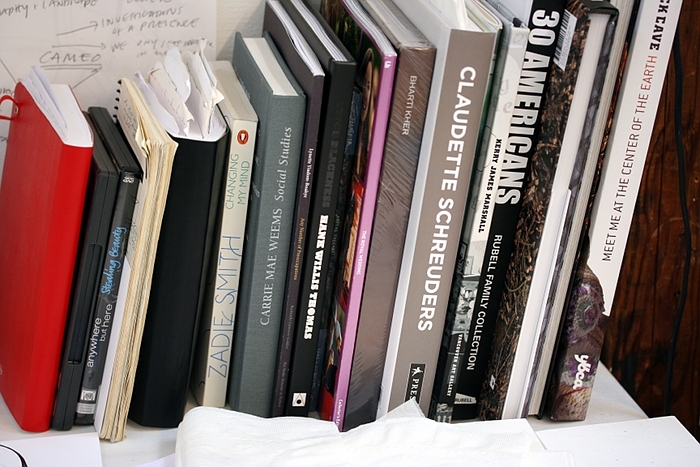 TO: It’s a tie between photographs of my family lying around or pinned up, and my books. The photos to remind me of where I come from and to remind me of my humility. 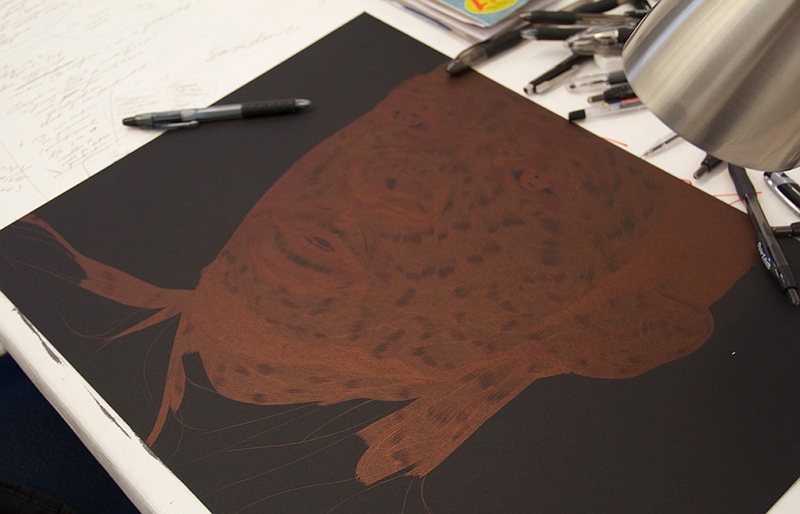 Visual artists are inspired by other visuals, no? The more I’ve traveled, the more I’ve come to realize how essential these objects are to my creative “energy” and calm. TO: My ballpoint pen collection. I use a variety of pens purchased from a variety of places. I enjoy how accessible and readily available pens are and what I can do with their seemingly rudimentary nature. The more ubiquitous they are, the more I feel compelled to twist the notion of what it is they are capable of. FYD: How did you grow up? TO: I grew up with a hardworking, Nigerian immigrant family mainly in southern region of the United States. We traveled a great deal while I was young, so I picked up drawing to provide a mental space for stillness in an otherwise restless situation. It’s strange to think of drawing as a solidifying element in one’s life, especially of flimsy pencil drawings, but it felt great to take a nebulous, seemingly mercurial idea in my head and “cement” it onto an object to exist in the world. That sort of need was essential to me during my formative years. They made me feel like I was worth something, that my ideas and my stories were worth talking about and included in the world. FYD: What do you love about the human face? TO: There’s this quote I stumbled upon recently that says it best. It’s from this film titled The Yellow Handkerchief (2010): “Your whole life is in your face. And I love that face.” I think it embodies perfectly how I feel about portraiture. There is a language to the face, a narrative that words can’t really express but color, light/shade, texture and other forms can. I love the act of looking at a face and finding the marks of time there. We live in an age where we are pressured to hide our blemishes and the traces that life may leave to mark on our dermis, why? It’s the most beautiful thing to see: the scarification of events written all over you, creating a language of which we can read from and learn from? FYD: What do you see in the face? TO: When I look at a face–any face–I see the beauty in the crow’s feet, the laugh lines, the scars…I find them intriguing for they add another dimension to how we see one another, and I want to learn more. 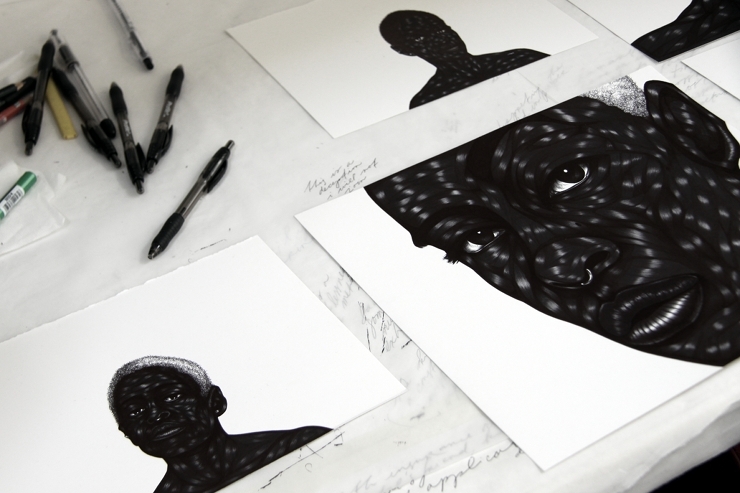 There is a surface fragmentation that happens in the way I mark up the face, but the idea is to break down the barriers of what we think the face–and the person–truly is, to get at something more. I love the act of looking at a face and finding the marks of time there. FYD: Are eyes the gateway to the soul? TO: Or more like a door to another reality. I don’t much about the “soul,” but I do know that eyes give perspective. When I focus on the eyes in a portrait, I am trying to capture a reality, even if that reality only exists for that moment, even if I don’t quite understand that reality myself. People latch onto eyes for familiarity, but they can also be that moment in the portrait that is the most “foreign” to them. There is interest because the possibilities of understanding what lies behind the eyes are limitless, and thus the read of a subject can be limitless as well. FYD: Artists are inspired by other artists. Who influences you? TO: Lately it has been Lucian Freud’s early and mid-career portraits. Paintings by Kerry James Marshall and Francis Bacon, are a constant. 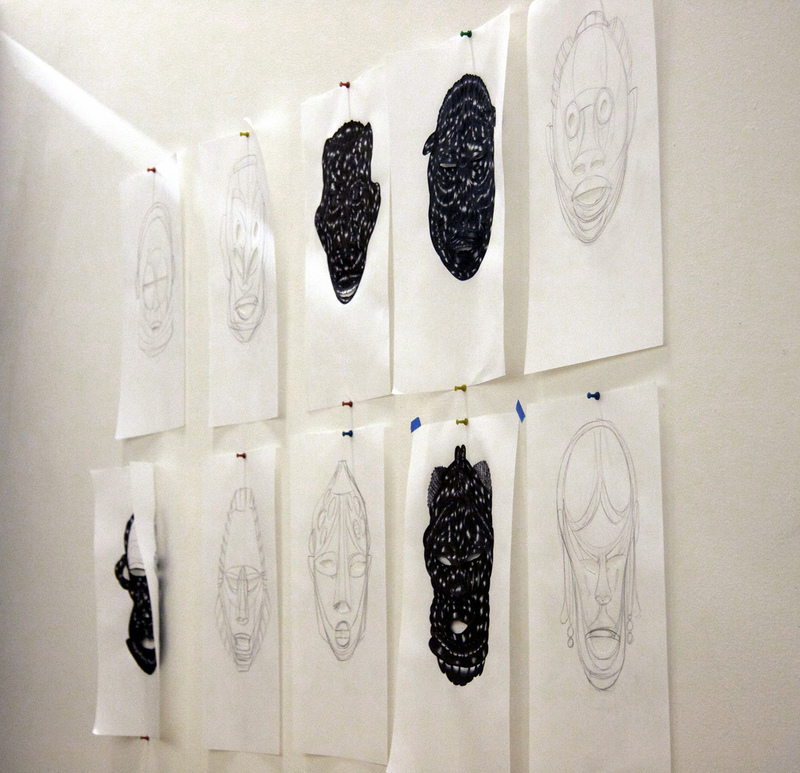 And the powerful prints ad sculptures of Elizabeth Catlett. Surprisingly, I have also returned to my first love, comic books. I was a HUGE Japanese manga fan in middle school and high school and, in returning to this love, I’m finding some refreshing and inspiring ideas from old favorites by the likes of Takehiko Inoue, CLAMP, Katsuhiro Otomo, and Moebius, to name a few. You have to be open to being proven wrong, which is really hard to do. FYD: What authors or writers do you connect with? TO: I really love James Baldwin’s works and the writings of Zadie Smith. 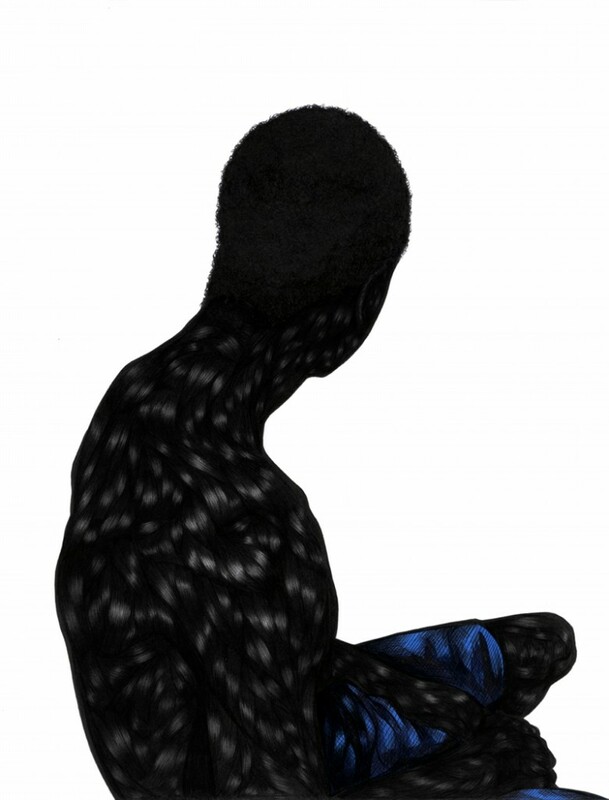 I have been listening to some audiobooks of Toni Morrison while I’m drawing; they have offered me insight and inspiration for what I have been embarking on with a series of “Black on Black” drawings. I also love the sharp wit and insight of Chimamanda Ngozi Adichie. FYD: Your blog props Ricky Gervais’ “Life’s Too Short To Go With The Flow.” How do you mix it up? TO: I liked Gervais’ article because I related to this notion of passion and what it means to be fully dedicated to an idea. I don’t think it necessarily means mixing things up, but it does remind us that we all are susceptible to change and contradiction. You have to be open to being proven wrong, which is really hard to do. I try my best to be open, but there are times where pride and the sudden need for self preservation comes in. However, I know that there will come a moment when I cannot stand being what I am now or maybe working with pens will be the death of me at some point and I’ll have to move on. I have to be able to acknowledge it when it comes, yet never lose my passion for working hard and believing in what I do. It’s all I have and will ever have to get me up and going in the morning. FYD: What are you working on next? TO: I’ve been really fortunate to be included in some group shows coming this fall and another solo show next year, so it’s helped me experiment with some ideas I’ve had floating around but never quite tackled while in graduate school. 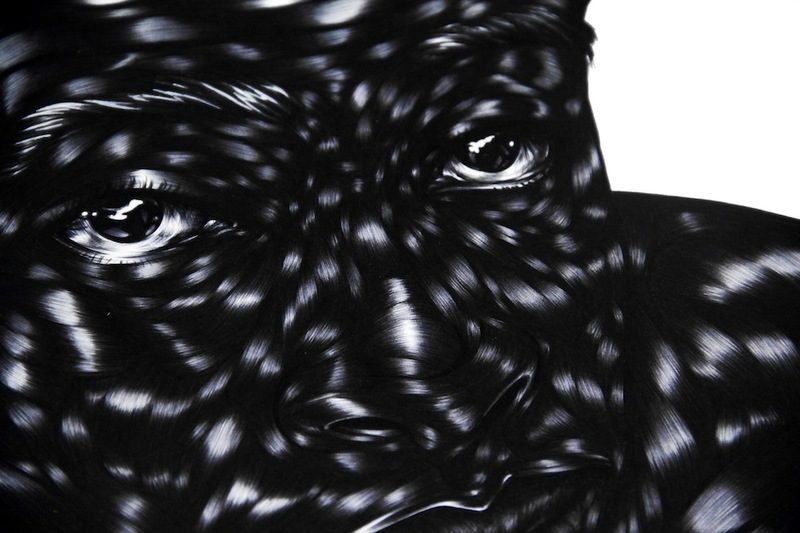 Since I graduate this May, I plan on taking some time to focus on a new series titled “Come Closer: Black Surfaces. Black Grounds.” which plays with this notion of “The Black Portrait” that has been nagging my brain for about a year or so. Toyin is on Twitter here and her blog is here.